Extreme fluctuations in mood and energy levels are the hallmark signs of bipolar disorder, a form of mental illness that causes severe psychological instability. Bipolar disorder involves more than just typical mood swings; it causes dramatic changes in emotional states, cognitive functioning, judgment, and behavior. People with bipolar disorder can veer from a depressed state to a manic high in a matter of weeks or even days, depending on the type of the disorder and the nature of their episodes. The effects of bipolar disorder are wide-ranging, causing relationship conflicts, occupational difficulties, an increased risk of suicide, and an overall decline in quality of life. The incidence of substance abuse is higher among individuals with bipolar disorder than among the population as a whole. The National Alliance on Mental Illness states that over half of people with bipolar disorder (56 percent) have a history of illicit drug abuse, while 44 percent have abused or are dependent on alcohol. When severe bipolar disorder co-occurs with drug or alcohol addiction, the potential for negative outcomes increases. A combination of therapies — including psychiatric medications, individual and group therapy, and intensive substance abuse treatment — can help these clients achieve a sense of inner balance and create more satisfying, productive lives. According to the Archives of General Psychiatry, approximately 2.6 percent of American adults have experienced bipolar disorder within any given 12-month period, and nearly 83 percent of these cases could be considered severe. Once known as manic depression, bipolar disorder is characterized by episodes of depression followed by elevated emotional states known as mania. The term “bipolar” reflects these opposite states of mind. The length of time that an individual spends in either state can vary based on the form of the disorder present. Bipolar I: Individuals with this form of bipolar experience the most dramatic transitions from mania to depression, and mood swings can be sudden and severe. The National Institute of Mental Health states that depressive periods in bipolar I typically last for at least two weeks. The level of functional impairment is high with this form of the disorder, and many of these individuals must be hospitalized in order to protect their safety. Bipolar II: This type of bipolar is characterized by less severe fluctuationsbetween emotional states. Depressive episodes may last longer and alternate with periods of hypomania, a milder form of mania. While it may be easier to function with this less severe form of the disorder, bipolar II can nevertheless interfere with normal activities and cause functional impairment. Cyclothymia: This mood disorder is marked by milder depressive episodes and periods of hypomania. Episodes of depression are generally not as long or as profound as they are with bipolar I or II. Bipolar with mixed features: In this form of the disorder, individuals may experience symptoms of mania and depression at the same time. For example, the individual may have elevated energy levels, sleeplessness, and appetite loss combined with feelings of despair, low self-worth, and sadness. Rapid-cycling bipolar: This manifestation of the disorder is characterized by multiple, rapidly alternating episodes of mania and depression, usually at last four within a 12-month period. Individuals with other forms of bipolar may go through phases of rapid cycling, in which their moods fluctuate very quickly. During rapid cycling periods, depression may be more severe, and self-destructive behavior and suicide attempts are more common. JAMA Psychiatry reports that although both depressive and manic episodes are functionally debilitating, depression causes more overall impairment, and the symptoms of depressive episodes are typically more severe. Substance abuse may occur in either state, but depression is likely to cause harmful symptoms such as self-isolation, suicidal ideation, and feelings of hopelessness, all of which increase the risk of alcohol or drug use.Bipolar disorder can also cause psychotic episodes, in which the mind breaks with reality and the individual experiences delusions or hallucinations. During a manic phase, psychosis might involve delusions of grandeur or wildly unrealistic beliefs about one’s capabilities, such as the belief that one could fly. During a depressive phase, psychosis may express itself as paranoid delusions of persecution or isolation from others. When psychosis occurs, suicide attempts, high-risk behaviors, and hospitalization are common. Bipolar disorder can be difficult to identify, especially in people who abuse drugs or alcohol. The extreme mood swings caused by this psychiatric disorder can resemble the highs and lows that individuals experience during periods of intoxication or withdrawal from substances. By the same token, substance abuse can intensify the highs and lows of bipolar disorder, making it hard to know whether these mood swings are chemically or psychologically induced. Some people with bipolar disorder experience a state called hypomania, a less extreme form of mania characterized by elevated energy levels, increased productivity, and more outgoing behavior. Symptoms of bipolar disorder can vary from one individual to another. Substance abuse may occur in either a manic or depressive state. When individuals are in a manic phase, they may use stimulants like methamphetamine or cocaine to prolong this high-energy period or depressants like alcohol or tranquilizers to calm down. In a depressive phase, sedatives or depressants may be used to calm feelings of hopelessness, while stimulants may be used to elevate mood. Although the origins of bipolar disorder are still unknown, there are several underlying causes and risk factors that increase the likelihood of developing this disorder. Heredity appears to be one of the primary factors involved. According to the Depression and Bipolar Support Alliance, approximately two-thirds of individuals with bipolar disorder have one or more family member who also has a severe mood disorder. Neurological factors also play a significant role in mood disorders like bipolar disorder. Brain chemicals called neurotransmitters, such as dopamine, norepinephrine, and serotonin, play critical roles in moods and energy levels. In people with bipolar disorder, these chemicals may be deficient or imbalanced, contributing to the severe emotional fluctuations and energy states. Hormonal imbalances and structural changes in the areas of the brain responsible for cognition and mood regulation have also been associated with bipolar disorder, according to Frontiers in Psychiatry. Current research indicates that there is no single neurobiological factor involved in bipolar disorder, but that there are several different pathologies that may trigger bipolar symptoms. An individual’s environment can be a risk factor for developing bipolar disorder. Children who grow up in stressful or abusive home environments may have a higher risk of developing mood disorders in adolescence or young adulthood, when the symptoms of bipolar disorder first manifest themselves. A chaotic or violent living environment can continue to trigger mood fluctuations later in life. Chemical dependence, sleep deprivation, and other lifestyle factors also contribute significantly to bipolar mood swings. Treating bipolar disorder and substance abuse can be complex, requiring intensive attention to the symptoms of mental illness as well as the behaviors associated with addiction. The results of treatment for individuals with dual diagnoses, or a mental illness co-occurring with a substance use disorder, are generally much better if both conditions are treated at the same time, within the same program. In order to provide the most effective care, staff should be cross-trained in mental health care and substance abuse treatment. The Centers for Disease Control and Prevention notes that the psychological and physical impairment caused by bipolar disorder make it the most expensive behavioral health diagnosis, both in terms of health care costs and loss of quality of life. Individuals with bipolar disorder may feel misunderstood, stigmatized, or isolated because of their illness. The disorder can have a negative impact on all aspects of a person’s life, from occupational functioning to the quality of relationships. Having the support and concern of a close friend or family member can make a significant difference in the outcome of treatment. Many people feel uncomfortable about broaching the subjects of mental illness and addiction with a loved one. However, it is important to remember that the course of addiction and bipolar disorder will rarely improve without professional intervention. Expressing concern to a loved one may feel awkward or embarrassing at first, but this conversation could make a significant difference in the outcome of the disease. Too often, the official diagnosis of bipolar disorder comes years after the individual has first experienced symptoms. The Journal of Clinical Psychiatry states that most people with the disorder do not receive treatment until at least six years after having their first episode. Because of this delay, symptoms tend to be more extreme and relapse is more common in the early stages of treatment. Intervening on behalf of a loved one who is displaying the signs of bipolar disorder and substance abuse could prevent these unnecessary delays and expedite the process of recovery. Motivational Interviewing (MI): Motivational Interviewing is a collaborative approach in which the therapist and client become partners in helping the client define sources of motivation and achieve self-defined goals. This positive, client-centered approach is especially useful in treating individuals who are working to recover from the effects of addiction. A study published in Issues in Mental Health Nursing showed that MI can help clients with bipolar disorder overcome ambivalent feelings about taking psychiatric medication. 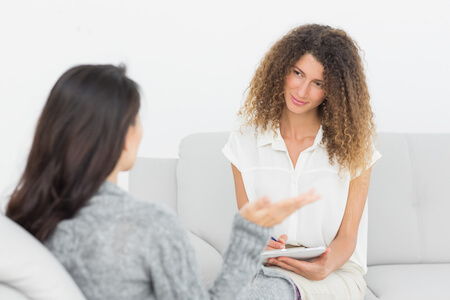 Cognitive Behavioral Therapy (CBT): CBT addresses the learned thought patterns and destructive behaviors that contribute to addiction, depression, and anxiety. Clients learn to identify self-defeating thoughts and actions, and replace them with more positive, self-affirming coping strategies. Solution-Focused Therapy (SFT): This practical, client-centered modality helps individuals with mental illness and addiction set and achieve specific goals. Rather than delving deeply into the origins of mental health issues or substance abuse, SFT focuses on measurable outcomes of therapy. Trauma therapies: A history of trauma, childhood abuse, violence, or chaotic living environments can increase the severity of bipolar disorder. Trauma therapies such as Seeking Safety and Eye Movement Desensitization Reprocessing (EMDR) target the unprocessed memories and internalized fears that can intensify anxiety or depression. Mood stabilizers: Lithium is the most widely prescribed mood-stabilizing medication for bipolar disorder. Lithium is most effective at preventing or reducing the severity of manic episodes and may be prescribed in combination with other medications. Anticonvulsant drugs: Anti-seizure medications such as divalproex (Depakote), lamotrigine (Lamictal), carbamazepine (Tegretol), and topiramate (Topamax) are also prescribed to prevent mood instability in individuals with bipolar disorder. These drugs are especially useful at reducing the frequency and severity of depressive episodes. Antipsychotic medications: Quetiapine (Seroquel), risperidone (Risperdal), olanzapine (Zyprexa), and aripiprazole (Abilify) are some of the most common antipsychotic medications used to treat the effects of bipolar disorder. These medications help to minimize the delusional thought patterns and erratic moods that characterize manic phases. Additional medications: In addition to psychiatric medications, pharmacologic treatment for bipolar disorder may involve medications that address the physical symptoms that can contribute to bipolar symptoms. These include certain blood pressure medications that slow down the activity of the central nervous system and medications that help to correct hormonal imbalances. In order to provide comprehensive care for a client with a dual diagnosis, substance abuse treatment should occur at the same time, through the same program.